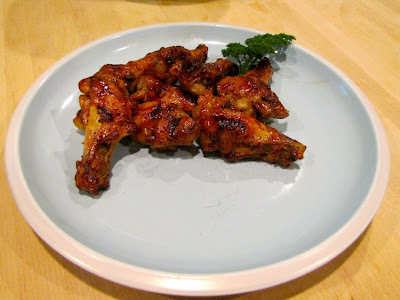 I love chicken wings. When I was at Marshall University doing my undergraduate work, we went to BW3 every Tuesday for quarter wing night. 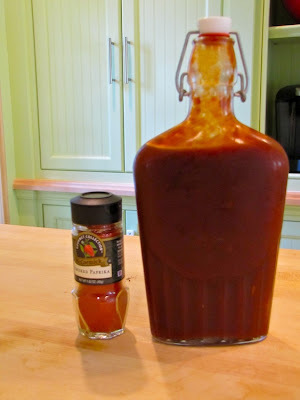 Over the last couple of years I've been refining a barbecue sauce recipe my mom gave me and now I won't go anywhere near BW3, my sauce is too good and I like my wings better. So today I offer you a great, simple wing recipe using two secret ingredients: my homemade barbecue sauce and smoked paprika. I start with several packs of chicken wing drumettes. Those are the little mini-drumsticks at the base of the wing. We've used packs of whole wings and separated the wing and drumette, we've used packs of wings only, but we keep coming back to the mini drumettes. 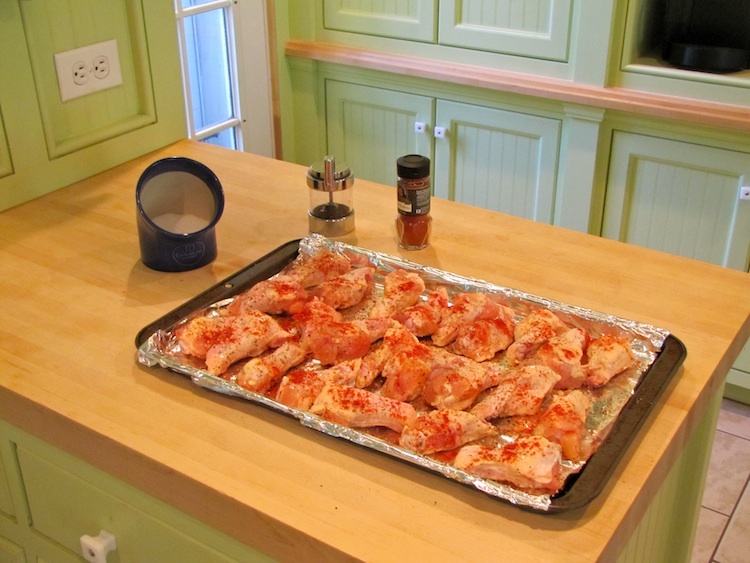 Spread out your wings on a foil-lined baking sheet and season with salt, pepper and smoked paprika to taste. Flip the wings and season the other side. A little salt, a little smoked paprika and a ton of freshly ground black pepper. That's all you need. Place the wings in a 400˚ oven and bake for 25 minutes. Flip the wings and bake for another 20 minutes. 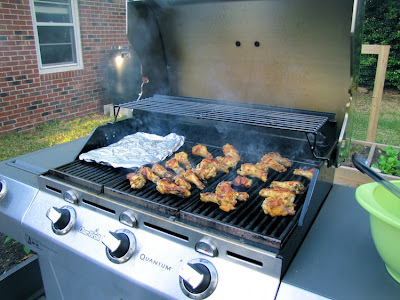 Start the grill so it is good and hot for the wings. Remove wings from the oven and take those bad boys out to the grill. There you'll throw them on the hot grill, turning them constantly to prevent them from burning. Our new grill with its inaugural batch of wings. At this point the wings are cooked, you just want to crisp them up. For two dozen wings, this takes about five minutes on my new grill. mmm, crispy wings. om nom nom nom. 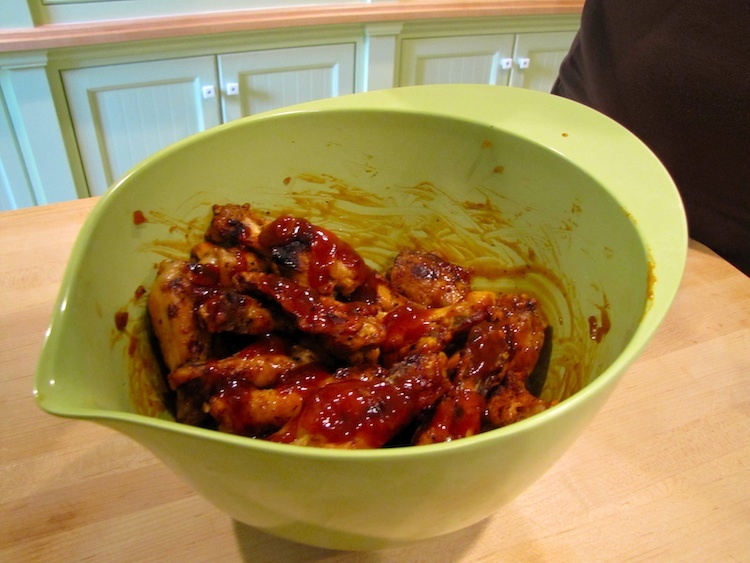 Remove the wings from the grill into a large bowl. Bust out your favorite sauce. For this batch of wings I used a homemade barbecue sauce, but I've also used Jack Daniels' BBQ, Sweet Baby Ray's, that recipe on the Texas Pete bottle and teriyaki sauce. 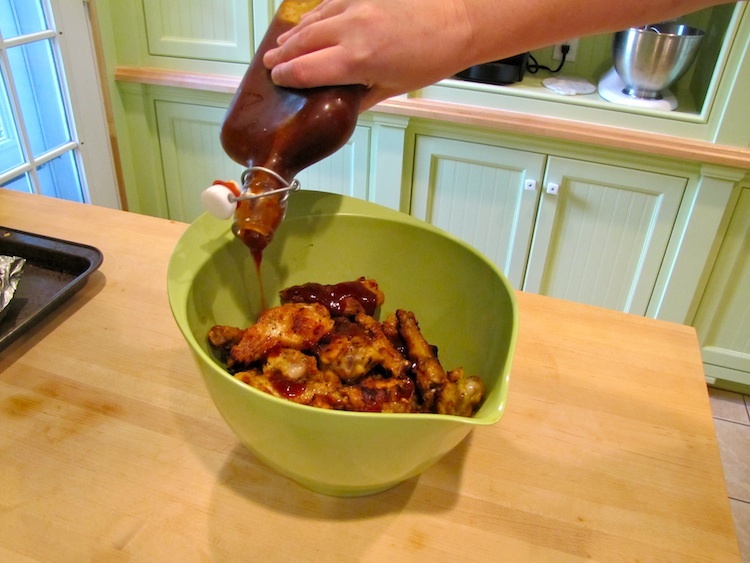 So, pour some sauce over your wings and toss to coat, adding more sauce as needed. Put them on a plate (or eat them out of the bowl, what do I care?) and chow down. Boom. Wings. And parsley. And room for foil-packet potatoes that were on the grill. 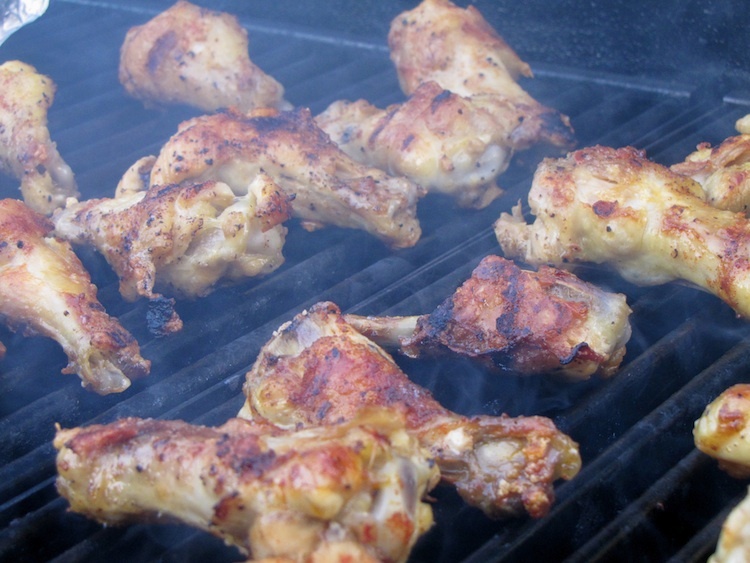 Three keys to great chicken wings on the grill: smoked paprika; bake then grill; always add the sauce after the grill, otherwise the sugars in your sauce will burn on the wings. Easy, tasty and fun.